Back to regular transmission this week with a full slate of 9 games (although we have already had one). We should see some much better scoring, but things don’t always go to plan and that is why we are always needing to Scramble! Well the byes are over finally and we can get back to regular rounds of footy which will hopefully mean a return to good scoring, however, going by last nights game I wouldn’t be too sure of that. It always seems to me that we see a horror round either before or after the byes which makes us wonder if they are really all over. Well we are one game down with 8 left to come this week and plenty of changes and things to worry about, so let’s not wait any longer…. let’s Scramble! Well it was quite a game last night but did you take the VC option? Let’s see how Calvin’s VC options went. JPK 121 He was great with 37 touches and 9 tackles. It meets the line set by Calvin. I would probably take it. Dusty 90 Started very slowly on just 24 at the half as he was tagged by Hewett. Don’t take it. Parker 106 Nearly got to the line but did spend some time off the ground after hyper extending his elbow and that really hurt his scoring. Lloyd 123 33 touches and 8 marks. If I had him as VC I would be locking that in. Calvin set his line at 120 this week and we saw some pretty poor scores from a few of our stars in this one but some great ones too, it all comes down to who you have and who you went with. I am always a bit risk averse and I would look at Lloyd and JPK as points in the bank and good insurance in case our captain pick fails. Hope you didn’t go with Heeney who had a concussion early in the second quarter (but was still out there until early in the third but hardly touched it in that time). Now that we don’t have to worry about the Byes anymore there are a couple of things that I usually look at when I am trading a player in. Here is a bit of a list of the things I worry about. Strength of Schedule. Who are they playing for the remainder of the year. And I don’t mean whether they are playing a top 8 or bottom 4 team, it is all about how many fantasy points their opponents are giving up. Hopefully we will be seeing Cal’s scale of Hardness return soon and this will help you work out how well we think they should score. Role Changes. What is the players role at the moment, we have now seen 13 games from everyone and we should now have a good handle on the roles. But as players are getting injured and may be out for the season then look at what that could mean in terms of a role change for other players. For example, what does Treloar being out now for an extended time do to players like Sidebottom or Pendlebury. Who do they play in the Fantasy Finals? Do they have a really good run in the last four weeks of the season. Recent Form. Don’t stress too much about overall average, but how have they gone recently. Some of them may have had a role change or they could have returned from an injury. I look at the last 4-6 games to get a good indication. One thing I am not too fussed about is their break even. If it is a player that I believe will be in the top scorers the I will pick them when I am able to bring them in. Their price fluctuations from that point mean nothing as you don’t plan on trading them out of the side. Quinton Narkle is set to make his debut for the Cats tonight. Just what we needed, a basement price player to bring in for AF. Marc Murphy returns finally and whilst I wouldn’t be bringing him in for salary cap games it is music to the ears of those that own him in Draft leagues. Matty Kreuzer is out as we suspected. If you don’t have any bench cover in the rucks (like most people) then he is a trade for me. If you can avoid a donut then do it. The key will be how many trades you have left in RDT and SC but I generally trade for donuts. Laird and Sloane both return for the Crows. Laird would still be in most teams but I wouldn’t be rushing to bring Sloane in my team at the moment. Treloar is out as we knew, but the key selection news for Collingwood is still no Murray, if you still have him it is probably time to trade him now. Lobb returns for the Giants at the expense of Cameron. Tim Smith. Seriously! In and then Out again. I have no confidence in him anymore, the problem is he hasn’t really made enough cash to justify trading him out. Spargo has been named in the squad for the Dees. Hopefully he can take the spot that has been vacated by Smith! Jimmy Webster is officially out which is disappointing as he has had a good season so far. Logan Austin has been omitted which is what most of us feared. He did rise quickly and made us some cash but we were worried about his job security. Michael Walters returns from suspension and should be the one to take the spot vacated by the injured Blakely. Let’s just hope he doesn’t hit anyone this week. Redman misses with that injury he picked up last week. Kobe Mutch has been named in the squad. Is it too much to ask for him to take that spot? With Blakely out this one becomes a little easier, but really I would have probably gone with the second option anyway at this point. I would be bringing Kelly into your side if you can as he doesn’t seem to be having any lingering effects of that groin injury. I don’t mind keeping Doedee, he is doing a good job and has excellent job security. Treloar and kreuzer, and now 5 out in backline. Was supposed to get last 2 rooks off field this week. Sometimes the Fantasy gods just keep on giving don’t they! Not sure what advice I can give you here mate other than just plug the holes as best you can this week and look forward to round 16! Love the work Dunny. Narkle or Sier or any of the other rookies? Cheers Dale. In AF I will be bringing Narkle in as I have some non playing rookies on the bench doing nothing and I just want to cash them in and I wanted a rookie to get the biggest bang for my buck. Are they ever likely to get on the field? I bloody hope not! As for a breakout player for the second half of the year. I think based on last night Parker could definitely be one of them. He got beaten around a bit but still managed to get over the 100 mark. I don’t know about Dusty, he is getting a lot more attention this season. Last night he was on just 24 at half time but piled on 42 points in the third quarter. I think that with Treloar out we will see Sidebottom lift a bit and I am expecting a better second half of the year from Dangerfield too. He hasn’t been himself this season and the more he plays with Gaz and Selwood both in the team the better they will all get at working together. Don’t forget that Trades are Sticky in RDT and SC today. I know I say it every time we have partial lockout, but if it saves just one of you it is worth it. In RDT and SC don’t be quick to sideways trade if you have less than 8 trades left at this point, you will need those trades as we get closer to finals. Not long to go now until Fantasy Finals, check your run home and your position on the ladder, you may be able to carry an underperformer for an extra week to save a trade. That’s it from me this week folks. 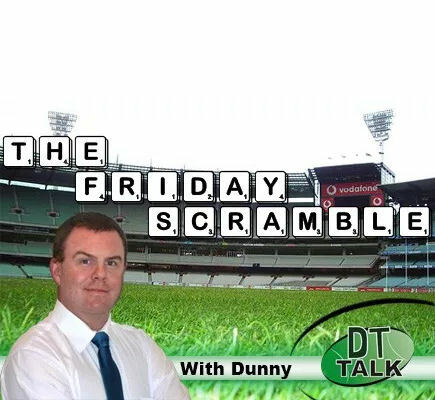 Hope you all have a fantastic Friday and enjoy having 9 games of AFL on again after the boring bye period that saw just one game on a Sunday! I look forward to seeing some big scores again this week after the pain of the previous three weeks (just not from my opponents hopefully). And if you don’t have a ticket to see Warnie, Roy and Calvin in Melb later in July, go and get yourself one, you will have a fantastic night! Want Kelly but Savage needs to go too. Phillips/Hurley v Kelly/Savage?? Anyone know what happened to Blakely and how long he’s out for? Blakely to Simmo or Whitfield? Crouch – save coin. Is he over his injuries to go bang? Redman and Treloar out Brad Lynch and Josh Kelly in. want to get Yeo but he has to wait a week or so with all the injuries thats been happening. Don’t know much about Lynch, but getting in Kelly and using the extra cash to upgrade Yeo next week sounds solid.. I want Kelly but really want Savage gone too. Which way you leaning? I’m leaning towards Seedsman out but I do have Redman that needs to go due to injury. I don’t know much about Lynch but he’s a 170k def who got named that why I got him in. Really want Kelly but he has only played GCS and BL in the last 2 weeks. I could always hold Redman this week and see how Lynch goes then trade him out next week. I’m in need of a defensive downgrade. Who has better job security? Lynch (WBD) or Smith (MEL)? Which 170k rook is the best bet – Narkle, Lynch or Sier? Did you change your avatar because you were so offended by that guy calling you four-eyes? Nah, MMMD has some obsession about me picking up Witts before the bye RDs and I just wanted to make him happy..
you did mention it quite a few times though, in his defense. I’d like to think Sier – he’s been smashing it in the 2’s all year and looks a direct replacement for Treloar. That said, I’m still not convinced if another big bodied mid is needed long term or more of an outside runner. I’m not sure what his tank is like just yet, he’s a bit of a late bloomer…with guys like Brown still in the 2’s and others, he may not last all that long if he doesn’t get into the swing of things quickly. However, he may be just the kind of player to free up Jordy & if that’s the way the Pies wanna go – then he could be long term! As for the other 2 options, I really don’t know much about them, other than what any of us can read here. He’s IN for me atm and I’m going to watch Narkle closely because if he can fill the role McCarthy had, he should keep his spot. I currently have: Titch, Kelly, Fyfe, Gibbs, Merrett, Danger, Guelfi. I traded Laird to DBJ couple of weeks ago (now on the never again list). Do I trade him back or do I go Simmo or Crisp? I see you’re also a victim of DBJ. I’d trade Laird back in if it fits your plans, he’s the #1 defender easily. Simpson or Brayshaw or Whitfield or Crisp? And either downgrade Ed Phillips to Sier or Austin to Hurley. Keep in mind if I trade Phillips then I can trade Austin to a top-6 defender, like I mentioned above. What are your thoughts? What do we reckon guys, gotta trade DBJ and Treloar. Repost from the Team Sheets forum because no one else but me seems to have left trace of themselves there this week. It’s lonely here. Well, you can see the problem in not posting this Team Sheets forum in real-time. I have mentioned it often enough. This is a fast kill of a formerly valued Thursday team drop chat. Seeing the problem yourself, Jelmsy, I cannot but think, trusting in your sense of stewardship of this forum, that it is not time management on your part, as you have sometimes argued, as much as it is an unpublicised policy determination by the “CEO’s”, that their Live chat coincident with the team drops, is given exclusive time without ‘interference’ from a Team Sheets forum set up at the same time. There was only very rarely, in previousl years, a time management problem in opening this forum in close to real time, with the opportunity for early discussion of issues arising from team selections. I do not believe you are killing this forum, Jelmsy, by allowing your own time management to effect the killing deed. If you are, then just get your act together to avoid forumicide. However, why would you kill the goose that lays your egg? Most of us would be appreciative of the Traders live chat during Team drops, but few of us would be appreciative at the loss of the effective use of this forum by delaying its opening – sometimes not until Friday morning when the Scramble supersedes the specific use of the Team Sheets as the go to Forum. We are not idiots. If the Traders have a live chat covering some aspects (but not detailed discussion amongst members) relating to team drops, and the Team Sheets discussion is now regularly delayed until well beyond the live chat session (towards midnight or the next morning), it is clear that, as a matter of unpublicised policy, the Traders live session is being prioritised over the Team sheets, reducing competition for attention. Those members who have valued near real-time discussion of the team drops have lost out. It should never have been viewed as Team Sheets competing with the Live cast, they should have been allowed, in members interests, to coincide. Instead we have the ‘Traders personalities event’ being prioritised over the members access to an effective team drop time discussion. Some would call it a policy of playing the man, and not the ball. I wouldn’t completely accept that view as I think there is good ‘ball’ in both the live cast and the Team Sheets, but someone is definitely hogging the ball and that hogging is causing death by starvation here in this dying Forum (which many of us previously deeply valued). Thanks for the post Plugger, obviously put a fair bit of thought into this! I’m not sure on the politics side of things, but agree that the team sheets post has been sorely missed this year. While listening to the boys live I always check the site to see if there’s any discussion while teams drop but unfortunately it’s been completely dead this season. Couldn’t it just be a timed post for 6pm AEST? Don’t need anyone to do a whole write up on teams, personally always get that info from AFL site first anyway. Anyone know much about Powell from the suns, is a mid/fwd @234k is a bit more expensive than narkle and co but ud reckon his job security is a bit better being at the suns, any thoughts? I had traded down to him last night, just changed it up. I know nothing about him, haven’t noticed his name mentioned in any of the magoos/milkmen news either (but could be wrong about that). Either way, I don’t think he’ll be doing much scoring vs the Pies, so swapped him out. Should I get Josh Kelly for Treloar this week or go for a unique like Tom Phillips or Matt Crouch? Flip your coin and be done with it!!! Go for a unique like Mark Murphy, Clayton Oliver, Dependlebury or Seb Ross. Good call Simon, Murph is as good as they come when he’s injury free..
Sidebottom vs Cripps vs Fyfe? My mids are Mitchell, Curnow, Zorko, Neale, Rocky, Kelly and Gibbs. Also thoughts on Holman to DeGoey for last forward spot? Other forwards are Buddy, Heeney, Smith, McLean and Gray.